While reading about the “produce market district” (aka the wholesale fruit and vegetable businesses in the Farmers Market area), I came across the above unlabeled photograph. At first glance I thought the building at the top right was the Adam Hats building/Ford assembly plant, but the neighborhood didn’t look right. 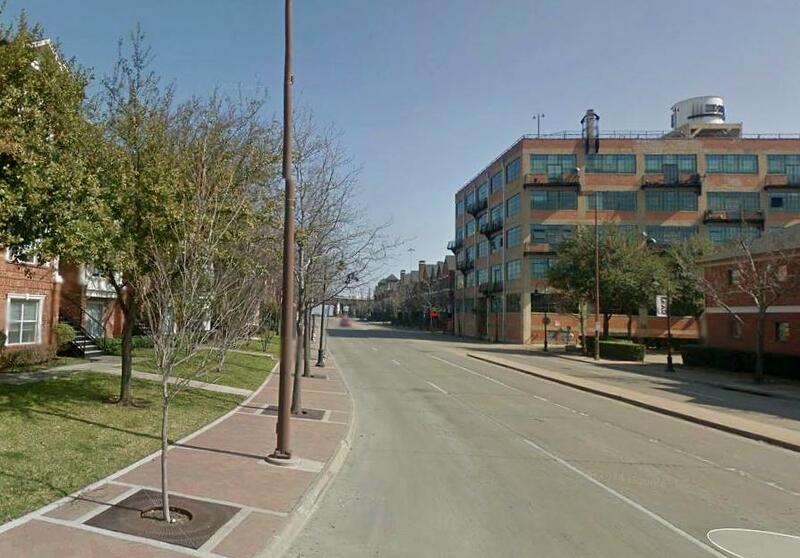 But on seeing the two Olive & Myers signs (a manufacturer I have to admit I’d never heard of), this seems to be a view of Canton Street, looking east from Cesar Chavez. The only thing that remains today is that cool building, which now contains pricey lofts and is known simply as “2220 Canton.” Below, the same view today. 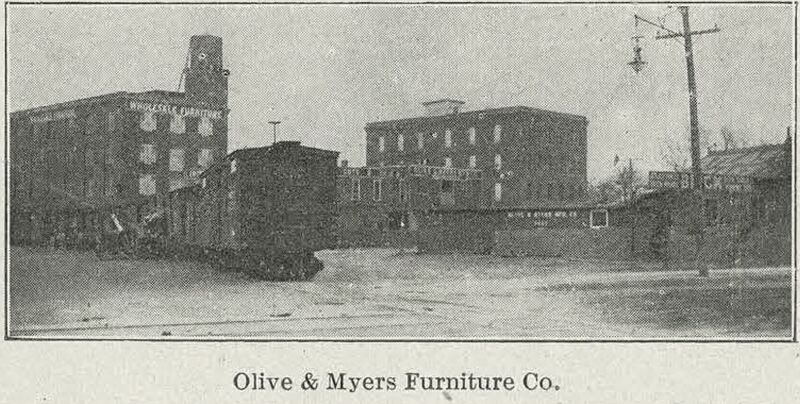 The Olive & Myers Manufacturing Company was founded in Dallas in 1899 by two Iowa transplants and became a very successful furniture wholesaler and manufacturer. The company was housed in a large complex of buildings grouped near the Farmers Market; the six-story building seen above was built around 1925. Even though it was quite attractive back then, the building’s current incarnation as super-swanky luxury digs (with a heated rooftop pool) would certainly put those poultry sellers of yore to shame. 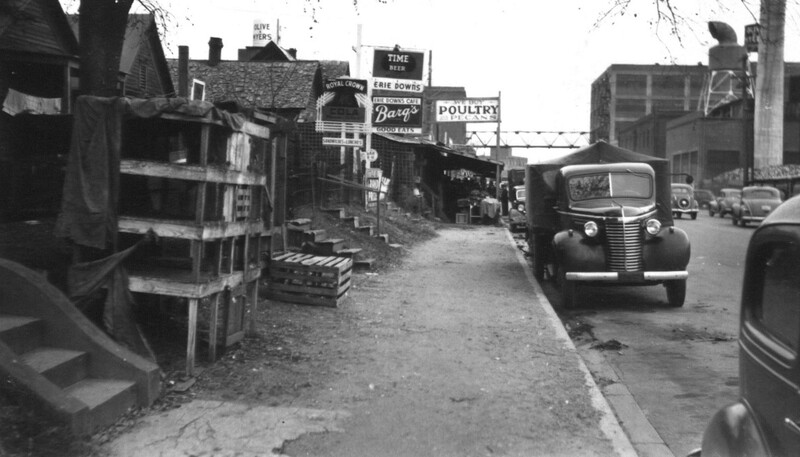 The sidewalk chicken coops may be gone, and the neighborhood no doubt smells a lot better, but, I have to say … a seedy and unsavory 1940s-era Canton Street looks a whole lot more lively and interesting than the scrubbed and fumigated 21st-century version. Color image from Google Street View, 2014. 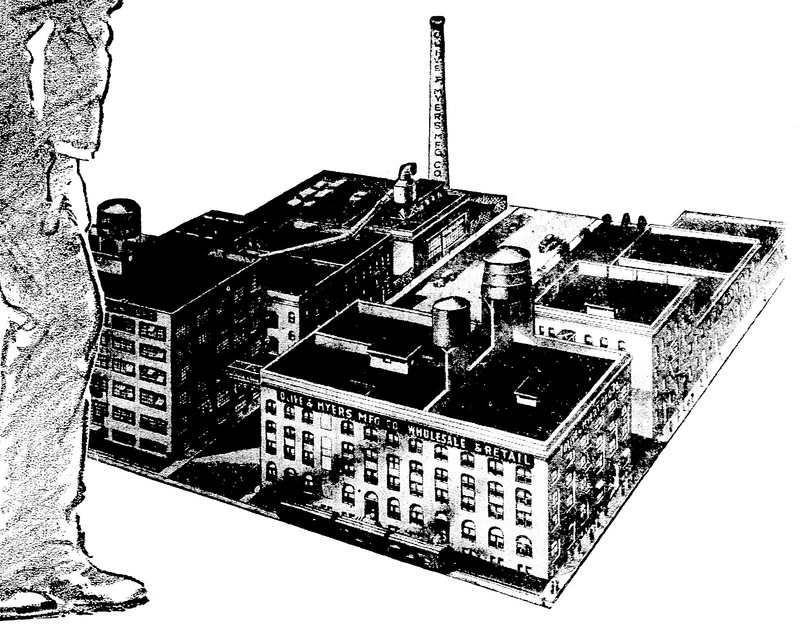 Olive-Myers logo from a 1937 ad. The circa-1905 photo is from a publication I neglected to note, but which I know is in the collection of the DeGolyer Library, Southern Methodist University. The blurry circa-1910 photo is from a publication called “History of an Opportunity: Facts About Dallas and Texas,” accessible in a PDF here; DeGolyer Library, SMU. The letterhead dated “10-6-14” is from the Spring, 2013 issue of Legacies, via the Portal to Texas History. For a follow-up post of sorts, I wrote about the darker side of the market area — full of crime and vermin — in the post “The Runyonesque Pearl Street Market, Full of Colorful Characters and an Army of Rats,” here. I’d like to hazard a guess at the date of this interesting photo. The truck is, I think, a 1940 Chevrolet and despite the fact it’s a working truck, appears very straight and the paint pretty fresh. Also, it’s at least a couple of years younger than anything else on wheels in this picture, save maybe one. So, a scene recorded some time between the spring of 1940 and Pearl Harbor? You’re probably right. I, too, was thinking early ’40s. The collection this came from covers 1938-1986.